When I first saw the swatches of the Zoya Ornate collection I was blown away! This is the first time that Zoya has done holographic nail polishes so I knew I had to grab all of them. I ended up grabbing 4 of the 6 polishes from this year’s holiday collection, and this is the first one I’m showing you guys today. I purchased the 4 colors with my Zoya Share the Love points. If you guys have been a follower of my blog for a long time then you know that I didn’t have the nicest words to say about the Share the Love program back in April when it first came out. I was surprised that they are still doing it, and that I even had any points in there! When I checked my account I had 500 points and saw that 500 points meant $15 off an order of $25 or more plus free shipping. I ended up getting 4 Zoya’s for just $17, which is almost half price! I think they had to work the kinks out of their program and now that the buzz has died down, they are offering some really nice offers with your points. If you want to know more about the Share the Love program, just ask me in the comments below! This was the one that I was the most nervous to buy because I was scared it was going to be a dupe of OPI DS “Extravagance”, which is a dark magenta scattered holographic. Well when I tore open the box I saw that they are similar, but not the same. This polish is definitely much more red and Zoya describes it as a Mulberry color. I still don’t know what mulberry exactly is, but I know I like the color! 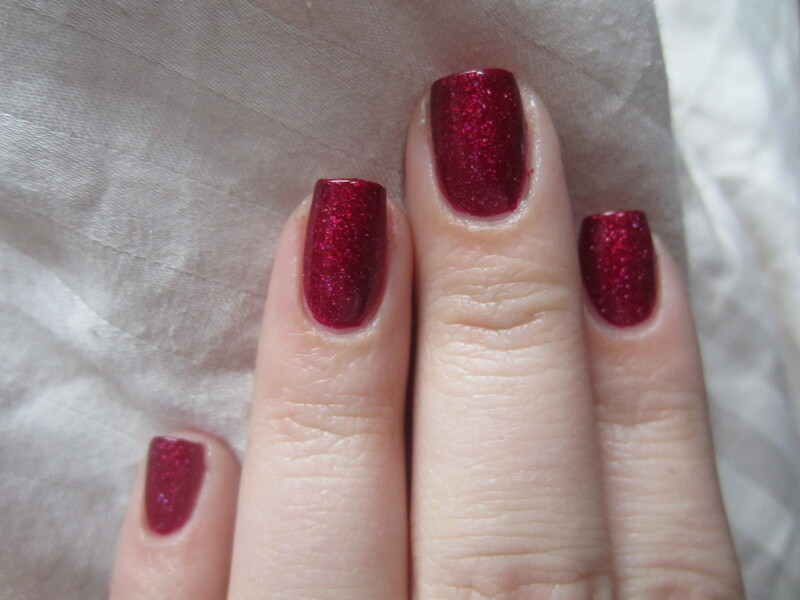 Zoya “Blaze” is a cranberry red scattered holographic. The polish looks different in every light! The picture above makes it look like a bright red with some pink tones, the picture to the right makes it look like a darker red that has a magenta glow, and the picture below shows some of the sparkle! The flash brought out the scattered holo that is in this polish. I will say that the holographic particles in this polish aren’t that strong. I’ve tried one of the other holographics in the collection (I still have 1 more to go) and that one shows a much stronger rainbow. It isn’t a bad thing, but its subtle. If you’re looking for a really prominent holographic sparkle, you might be a little disappointed with this polish. But I really like this polish, the depth of the color is great and I love how it looks on my skin tone! I love the sparkle and how it seems to glow! The formula was really nice. It was really pigmented, almost opaque in 1 but needing 2 coats. The dry time was a little more than average, but not so long that I really had issues. No complaints, its a really nice polish! What do you guys think? Do any of you have this? What are your favorite holographic polishes or your favorites from holiday collections this year? Holly, this colour is still really pretty despite its weak holographic nature. Gorgeous for this time of year too! i bet this looks awesome on you too! especially for the holidays! thanks! it really is stunning!